We recently spent several days at Great Wolf Lodge in Williamsburg, VA and had a fabulous time. While promoted mainly as an indoor waterpark, it offers so many things to do for kids of all ages. It is a perfect "long weekend" destination for families. I'd been wanting to visit Great Wolf for awhile, and decided to take 3 days over President's Day week to make the 3 hr trek to Williamsburg. Thank goodness for in-car DVD players, because you "never know" how a road trip longer than an hour will go with a 2 yr old and 6 yr old in tow. Needless to say, both kids did fine with minimal fussing and the movie musical Annie on continuous loop. The lobby is warm and inviting, and filled with woodland animals to discover. Check-in was easy as you can set it up ahead of time online. Everyone gets waterproof bracelets to wear during your stay. The bracelets also serve as your room "key" and used to pay for anything purchased, including meals and souvenirs. We stayed in the Wolf Den Suite which has a queen bed plus a mini "room" for the kiddos that has a bunk bed...big hit! The room was clean and well maintained, something I found to be true of the entire place. Hands down the biggest attraction is the main one, the indoor waterpark. The girls (especially Sam) had a ball there. Open from 9 am -9 pm, kids can get hours and hours of entertainment all in one area with multiple pools, slides, waterfalls, and games. Maddy spent all of her time in the kiddie pool where there were little waterfalls and mini geysers to splash in. There were also a few slides for small kids to go on, but she flat-out refused. She is still warming up to the idea of doing more than splashing a little in a pool (she still screams 50% of the time in swim lessons) so she was happy to get her feet wet, look cute in her suit, and wave to other people in the pool as if they were her guests. This (left) was the most I saw of Sam for the majority of the time we were at the waterpark. She refused to stand still for a picture, there was just too much too do, too many other kids to go make sliding friends with. In addition to the waterpark, kids can play mini golf, go bowling, play in the arcade, get a mani/pedi in the Scooops Kid Spa, and play MagiQuest. We didn't have time for golf or bowling, but Sam did have fun using her magic wand and solving the first level of the Quest. There are ongoing activities in the lobby for kids of all ages, including face painting, balloon animals, a dance party, and 8 pm storytime in your pj's. Overall it was a wonderful experience for our family. My husband and I were impressed with all of the things there were to do - too much for our "first timer" eyes and minds to absorb and take advantage of in 2 short days! The food was pretty good in the main restaurant (served buffet style) and everyone, I mean everyone, on the staff was very friendly. You could tell they really wanted to make sure you were having a good time and experience at their resort. Get a Paw Pass. A Paw Pass is a lanyard your child wears around their neck that is a “ticket” to experience all of the fun little extras Great Wolf offers. It saves you a significant amount of money over paying individually for those activities. It can also act as a bit of a map for first time visitors, letting you know all that’s available to do. It gave us tokens to the arcade- so we went and found the arcade. It gave us a chance to get a glitter tattoo and make a stuffed animal…we found those places. One of my favorites was the chance to decorate a t-shirt at the Cub’s Den. I am quite sure we would have overlooked this little oasis. And it was a lovely chance to sit with my daughters and color a keepsake. The pass also allows you a wand and a chance to play MagicQuest. Bottom line- that pass was the best way to know about and take advantage of what the Lodge offers. Pack Smart. All Great Wolf Lodge rooms have a mini fridge, coffeemaker, and microwave. This means you have the option to bring your own snacks, beverages, and meal fixings, should you choose to save some money. I saw some "seasoned" Great Wolf families bringing in crockpots! Get each kid their own wand. 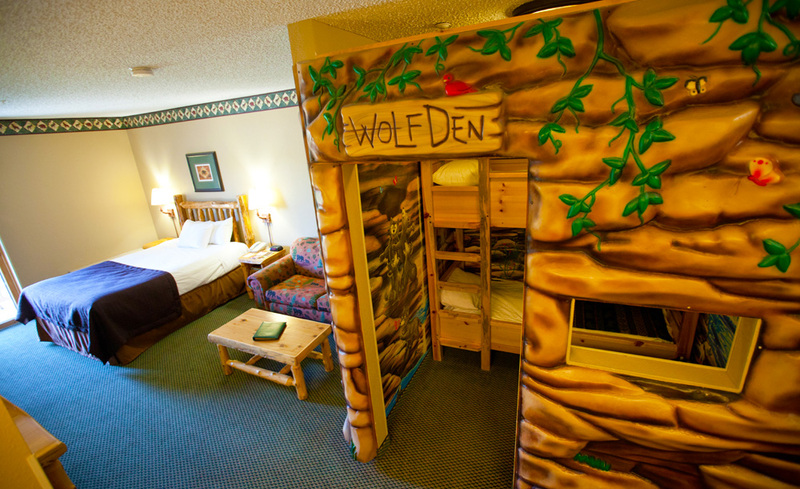 Even if you're not getting the Paw Pass or doing the MagicQuest game (ages 5+), Great Wolf brilliantly made their woodland animals and other figures throughout the lodge "come alive" when you wave one of their magic wands at them. Now I know at $17.99 a pop these are not a cheap souvenir, but the kids DO have a wonderful time seeking out and finding all of the places and things that they can "Abracadabra" at. Go down the slides at least once with your kids! It's been a long time since I've been down a waterslide...like 4 or 5 bathing suit sizes ago. And being a Mom doesn't always make you the "fun" parent..heck, neither does being a Dad. But when you're on a family vacation, it's important to not just view this time as another place you have to "damage control" every situation, every minute....unless you have a 2 year old bent on chaos and destruction like I do. My point is, be sure to take it down several notches and remember YOU are on vacation too! This means you can relax a bit, and take an opportunity to have some extra fun and "adventure" with your family. And if your kids wanna slide, then you should slide too! It doesn't have to be on the biggest, baddest slide Great Wolf has either - go down the kiddie slide together if that's more your speed. Even if you're all a little scared, take the opportunity to show your kids you CAN overcome a little fear, squeeze your booty into the tube, and scream bloody-murder all the way down. I went on the slides with Sam 4 times and had a blast each and every time. In fact, I made sure to tell her how impressed I was that SHE was able to go on them by herself over and over and over......and over. Did I mention she stayed on the slides pretty much the whole time? The last time we went up together (me huffing and puffing all 6 flights, holding a double inner tube) she said she was "so happy inside and out Mommy." Sounds like a lot of fun and I bet the kids slept well!